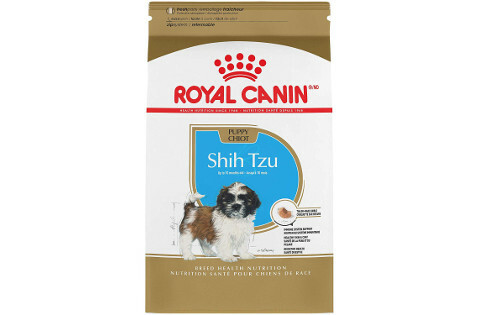 "Formulated for Shih Tzus 10 months old and up. Unique shape helps your Shih Tzu eat easier with their shorter muzzles and underbites." "Specially formulated for small breed senior dogs that comes loaded with essential vitamins, nutrients, and minerals that help support your senior dog." "Uniquely shaped kibble with essential vitamins and nutrients that ensure strong growth for your Shih Tzu puppy." "Each bag of food has so much dried meat in it to hold your dog's attention and to keep them coming back for more at meal times." "Healthy mix of lean protein, spinach, flaxseed, and blueberries that give dogs a balanced meal." "Contains no grain, gluten, filler ingredients or poultry by-product meal. Limited ingredients means less chance to upset your dog's stomach when they eat it." This dog food is specially formulated to meet any and all nutritional needs or Shih Tzus from the age of 10 months and up. The kibble comes in a unique shape that makes it easy for your dog to eat with their shorter muzzles and underbites. This breed-specific food helps to support healthy skin and coat, and it has higher levels of fatty acids that help to keep your dog's coat soft, shiny, and healthy. It also comes packed with vitamin A, DHA, and EPA to support healthy growth and development throughout your dog's life. There is a higher amount of fiber in this food to help ensure that your dog's digestive system stays regular, and this is important because you don't want runny stools with a longer coat. It contains a decent amount of protein as well to help support your dog's muscles, tendons, and bones. Shih Tzu parents who bought this food were happy that it came specially formulated to support their dog's systems throughout their lives. Shih Tzu parents did mention that the kibble was slightly harder, and this could be a problem for an older dog. 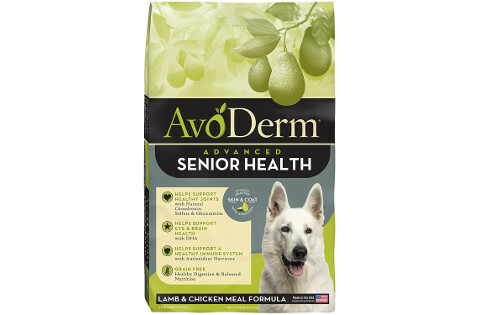 Specially formulated for small breed senior dogs, Avoderm's food comes loaded with essential vitamins, nutrients, and minerals that help support your senior dog both internally and externally. You get the choice of four different styles and four different sizes that allows you to customize your order to your dog's dietary needs. This food supports your senior dog's brain, eye, and joint health because it contains Glucosamine, Chondroitin Sulfate, and DHA. It comes formulated with California avocados to help ensure that your dog a nourished skin, a healthy and shiny coat, and a healthy immune system. Your dog will get small and crunchy kibble pieces that are easy for them to eat and digest. Finally, this dog food is also free of any wheat products, corn products, soy, artificial preservatives, colors, or flavors, and this reduces the risks of allergies or sensitivities. People who bought this food for their senior Shih Tzus were happy that it has avocados to help support their dog's skin and coat as well as Glucosamine and Chondroitin for joint health. People who bought this food for their senior Shih Tzus did say that this food is slightly more expensive. This food can meet the nutritional requirements of Shih Tzu puppies that range in age from eight weeks old up to 10 months old. Your puppy will get an extra boost to their immune system with this food because it contains higher levels of antioxidants and vitamin A. The nutrients in this food are excellent for encouraging healthy skin and healthy coat growth. The tailor-made kibble makes it easy for your Shih Tzu puppy to pick it up and eat it, and this is important because this breed has shorter muzzles and they tend to have an overbite that can make eating difficult. It has a mix of quality protein and probiotics that help give you puppy the nutrients they need and keep their digestive system regular. You should start seeing less runny stools as they transition to this food. Puppy parents who purchased this Shih Tzu puppy food liked that it has a uniquely shaped kibble combined with a lot of essential vitamins and nutrients that ensured strong growth. Puppy parents did mention that this food can take a while to fully transition their dog too. 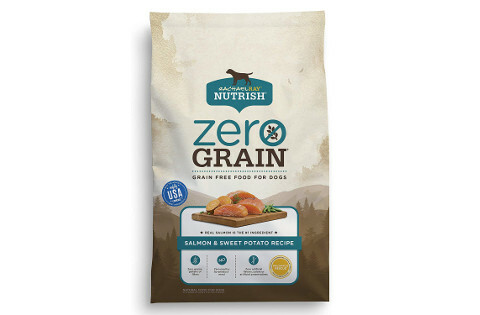 The first ingredient on this dog food's label is fresh chicken that is locally sourced from farms around the United States. 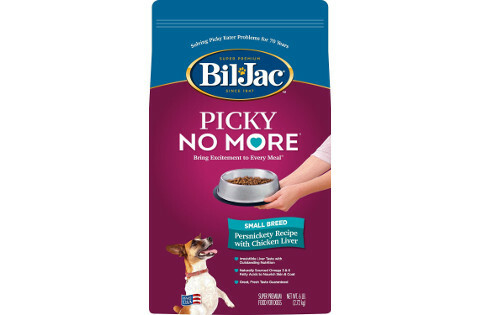 Every six pound bag of this dog food for picky eaters contains around five pounds of dried chicken. The dry vacuuming process is performed at a lower temperature to seal in the essential nutrients like fatty acids while taking the moisture away. The food also contains a good amount of chicken liver mixed in to help entice even the pickiest Shih Tzus to eat at mealtime. This food comes packed with all of the vitamins, nutrients, and fatty acids your dog needs to thrive, and it helps to ensure that your dog has healthy skin, a fully and shiny coat, and a healthy immune system. There is no soy, gluten meals, wheat, protein concentrate, or rendered fat. Dog owners were happy that each bag of food had so much dried meat it in to hold their dog's attention and to keep them coming back for more food at mealtimes. They didn't like that this food only comes in one size because it means that they have to order more frequently. 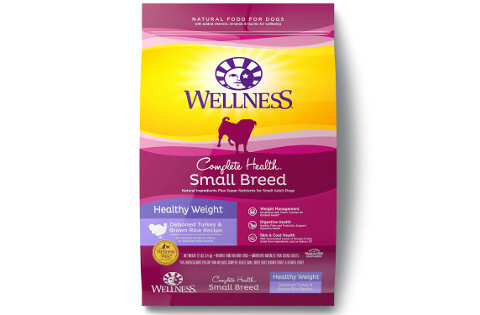 This complete health small breed dog food by Wellness Natural Pet Food smaller kibble that is easier for your dog to eat and digest. It also has a less calorie-dense formula that is enhanced by a lean protein source. Your dog will enjoy the taste of lean turkey, blueberries, spinach, and flaxseed in every bite, and this means that the food also contains high levels of antioxidants to help support a healthy immune system and cell health. It's formulated in the United States to very strict standards. This food contains only quality natural ingredients, and it excludes things like soy, wheat, corn, meat by-products, preservatives, artificial colors, and artificial flavors. The higher protein content helps to fill your dog up on smaller portions, and this promotes weight loss. People who purchased this food for their dog liked that the kibble has a healthy mix of lean protein, spinach, flaxseed, and blueberries that gave their dog a balanced meal each time they ate it. However, people who bought this food for their dog did note that it could cause digestive upset in sensitive dogs. Rachel Ray's grain-free dog food comes in four different flavor combinations including salmon and sweet potato, chicken and sweet potato, turkey and potato, and beef, potato and bison. There are also nine different sizes to pick from that allows you to customize your order. It's great for dogs who have sensitive stomachs and allergies because it contains no grain, gluten, filler ingredients, or poultry by-product meal. This means that there are less ingredients to potentially upset your dog's stomach when they eat it. Real meat is the first ingredient listed on the bag's nutritional panel, and the potatoes are an excellent source of natural fiber that can work to keep your dog's digestive system regular. It also has peas, tapioca, beet pulp, chicken fat, and whole flaxseed fat for essential nutrients. Shih Tzu owners who purchased this food for their furry friend liked that it came with a more limited ingredient list with alternative carbohydrates, nutrients, and fiber. They didn't like that this food had rounded kibble that could be more difficult for their dog to pick up. The Shih Tzu dog breed is a small dog with a huge personality that is extremely popular all over the world as a loyal and protective pet. It can be a challenge to find a dog food that they'll eat because they're notoriously picky, and they also have a long double coat that requires additional nutrients. We understand the struggle that comes with picking out the best dog food for Shih Tzu dogs, and this is why we rounded up our top six picks and reviewed them. We've also outlined what you want to watch for in your dog's food to ensure that it has all the necessary ingredients for a happy and healthy dog. Unfortunately, Shih Tzu dogs are prone to having dental problems and allergies to many common ingredients in traditional dog food. This can make it difficult to find a food that your dog likes and that they can comfortably eat. Shih Tzu dogs have shorter muzzles in relation to their body sizes, and it's not uncommon for them to have an underbite. This can make it very difficult for them to pick up regular kibble, and it's a primary reason why people who have these dogs get specially formulated kibble shapes for them. Their teeth can also cause them problems, and a huge portion of Shih Tzu dogs over the age of two have some form or periodontal disease. This can result in inflammation at the gum line, plaque build up, tooth decay, and abscesses. There are several things that you want to keep an eye out for with your dog's food. This can help to ensure that they get a balanced meal at every meal time. Since this dog has a problem with quickly gaining weight, you want to look for a food that is higher in protein and lower in carbohydrates. Your carbohydrate levels should be around 25-percent or lower, and double check that they come from sources like peas or potatoes or whole grains because they can set off your dog's allergies. Both dry and wet food can contain all of the nutrients that your dog needs to stay healthy throughout their lives, but wet food won't help to clean your dog's teeth when they eat it. You could always feed them dry food with a little wet food mixed in to tempt their appetites. Healthy fats like Omega-3 and Omega-6 help to support healthy growth for your dog's long and thick coat, and it also helps to ensure that their skin is nourished. Look for a food that has a fat content between 15 and 20-percent, but monitor it closely because this can also cause your dog to gain weight. As we mentioned, these dogs have shorter muzzles that can make eating larger kibble extremely difficult. Remember to keep the size and shape of the kibble in mind if you're not buying breed-specific food. Look for a smaller kibble with a flatter shape instead of a large or round kibble. You want your dog's protein to come from a lean source like turkey, chicken, or salmon, and it should be in the first few ingredients on the bag. An active adult Shih Tzu should get between 30 to 35-percent protein a day while less active ones get slightly lower at 25 to 30-percent. Since this little dog can live well over 10 years old, it's essential that your dog's food has a good amount of vitamins, minerals, and antioxidants included. You can find these things in fruits and vegetables like blueberries, leafy greens, carrots, spinach, and peas. Along with what you do want, it's essential that you understand what you don't want in your dog's food because you'll be able to rule them out quicker. Animal derivatives is a blanket term that a lot of manufacturers use to hide unsavory ingredients that they put into your dog's food like feathers, hair, and other things that may not agree with your dog. Your dog food label should have clearly listed ingredients that are transparent and easy to understand. Beef may be a good source of protein for your dog, but it's also an ingredient that a lot of dogs have a problem digesting. You would most likely have more luck feeding your dog an alternate protein source like lamb, salmon, or turkey because they're easier on your dog's system. Many dogs have sensitivities to corn, wheat, soy, or gluten that can cause things like dry or itchy skin, dull coat, bloating, discomfort, and gas. Look for a food that is free of these ingredients. They're usually cheap fillers that don't have nutritional value for your dog anyway. Another thing to avoid in your dog's food is poultry by-products because this is a filler agent that typically includes things like heads, intestines, lungs, and hearts. In other words, it's the things that don't go into human food. You don't want to feed these to your dog either. 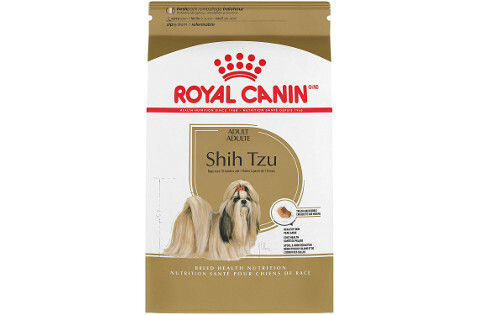 Our top pick for the best dog food for Shih Tzus is Royal Canin Breed Health Nutrition Shih Tzu Adult because it contains an exclusive list of ingredients that meet all of your Shih Tzu's dietary needs from 10 months and up. The unique kibble shape was another reason we chose this kibble because it was easy for the dog to pick up and eat. It also supports healthy development by having higher amounts of vitamin A, DHA, and EPA. Finally, this food helps to prevent runny stools that could cause a matter coat and a mess.